Zhang Zhiyang Settles The Score in Beijing! After five trips to the Top 8, Zhang Zhiyang emerged victorious in his hometown. Not only did he earn his first Grand Prix title, he also made the entire local community beam with pride. THE HASHTAG FOR GRAND PRIX BEIJING IS #GPBEIJING. JOIN THE CONVERSATION. As legendary characters new and old rise to prominence on Dominaria, so did Zhang Zhiyang. 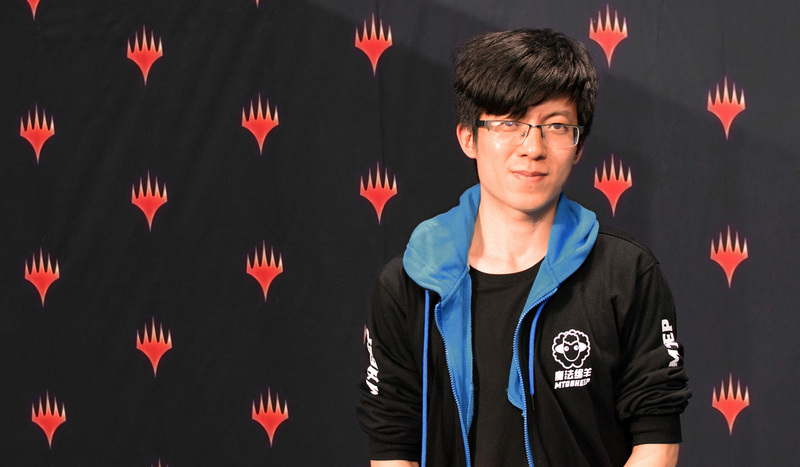 Maneuvering past 908 other players here at Grand Prix Beijing, the legendary Zhang took it all down on the back of his adamant will and mastery in the Dominaria Limited format. Powering through the Top 8 with his stellar Green-White deck, he defeated Zhi Yimin and Yuki Matsumoto in the quarterfinals and semifinals respectively, before dispatching end-boss Ken Yukuhiro in the finals. Thanks to well-built aggro deck with a beautiful curve - topped by Multani, Yavimaya's Avatar - Zhang was able to dominate in the third and final booster draft of the weekend, dropping only a single match during the elimination rounds. Rounding out the Top 8 were quarterfinalists, Souta Katakawa, Mao Dun, and Rei Sato, as well as semifinalist Ryosuke Urase. All eight players earned invitations to Pro Tour Atlanta six months from now, becoming the first few players (other than Pro Tour Hall of Famers, Platinum, Gold, and Silver pros) to secure their spots. As we wrap up this historic weekend, we'd like to congratulate Zhang once more winning Grand Prix Beijing 2018. It is not in the stars to hold our destiny but in ourselves, and we write our own stories. Today, Zhang Zhiyang did precisely just that and cemented a spot for himself in Magic's illustrious history. Dominaria is a historic plane with a deep and fascinating history, where primordial dragons clashed, and planeswalkers fought cataclysmic duels. 909 Dominarians showed up to compete for the champion trophy, and after nine rounds of Swiss, four players rose to the top, namely Wu Kon Fai, Wang Haokang, Ken Yukuhiro, and Liu Tianyu. Going down the list, more familiar names catch our attention. Riku Kumagai, Lee Shi Tian, Kazuyuki Takimura, Kenta Harane, Yoshihiko Ikawa, (5) Yuuya Watanabe, Sugaya Hironobu, Teruya Kakumae, Yuki Matsumoto, as well as Chinese household names Yu Yin, Gao Tan, Du Xuetong, Lei Qiang, and Liu Yuchen all survived the 6-2 cut before advancing to 7-2 after the ninth round. 180 players will return tomorrow for six rounds of Dominaria Booster Draft before the Top 8 cut determines who will make the Final Draft table. Check back tomorrow as the action unravels. Meanwhile, Skittering Surveyor continues to rule the day and win everybody's hearts!